Today we report in Cell our first computer-designed nanoparticle vaccine targeting respiratory syncytial virus (RSV). 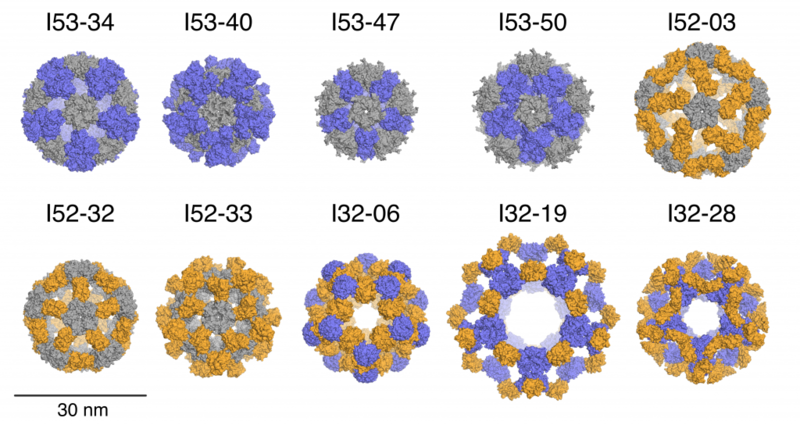 Researchers in the King lab created the new vaccine candidate by fusing a stabilized version of RSV F, a glycoprotein from the virus responsible for membrane fusion, onto their designed two-component protein nanoparticle platform. 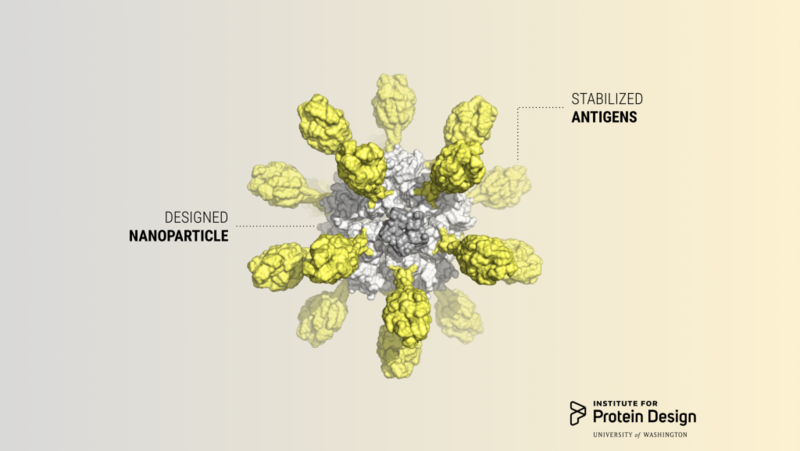 This yielded a self-assembling vaccine that can be tuned to display a variable number of antigens by stoichiometrically mixing different versions of the purified parts. 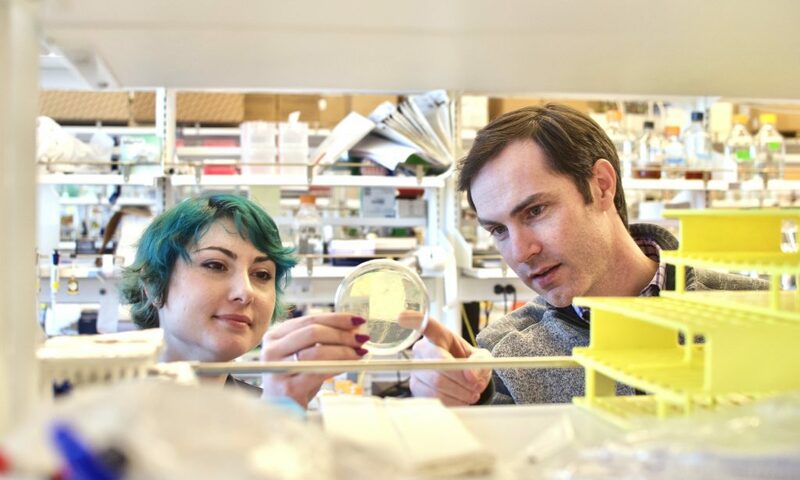 Vaccine researchers Brooke Fiala and Neil King in the lab. Because the core of this vaccine consists of an computer-generated, ultrastable nanoparticle, this multivalent vaccine candidate — dubbed DS-Cav1–I53-50 — is more stable than the trimeric antigen (DS-Cav1) alone. DS-Cav1–I53-50A exhibited no discernible loss in antibody binding as measured by bio-layer interferometry after being stored for two weeks at 37°C relative to -80°C. 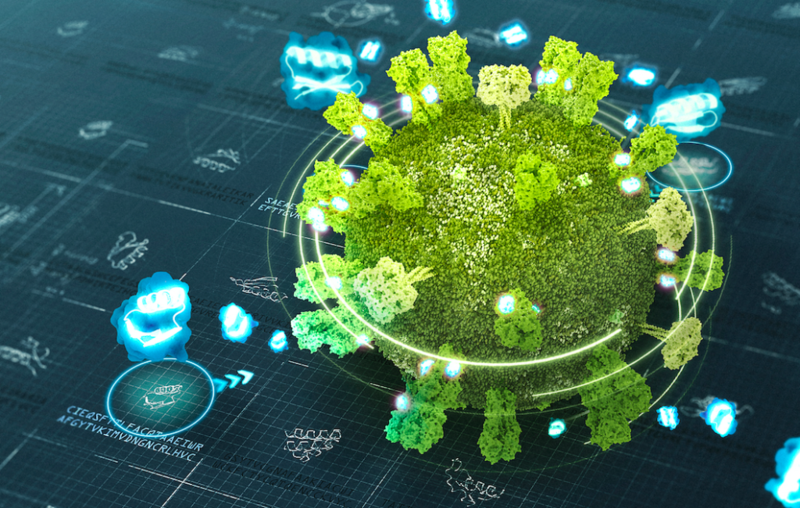 This extremely high stability may ultimately translate into a vaccine that does not require refrigeration, greatly reducing the cost and complexity of global vaccine distribution. DS-Cav1 is a prefusion-stabilized variant of the F glycoprotein trimer developed at the National Institute for Allergy and Infectious Disease Vaccine Research Center at the National Institutes of Health that has elicited significantly higher neutralizing antibody titers than postfusion F in naïve mice and non-human primates, cattle​ and, most recently, healthy adult humans. DS-Cav1 is itself being evaluated in a Phase 1 study by NIH as an RSV vaccine candidate. 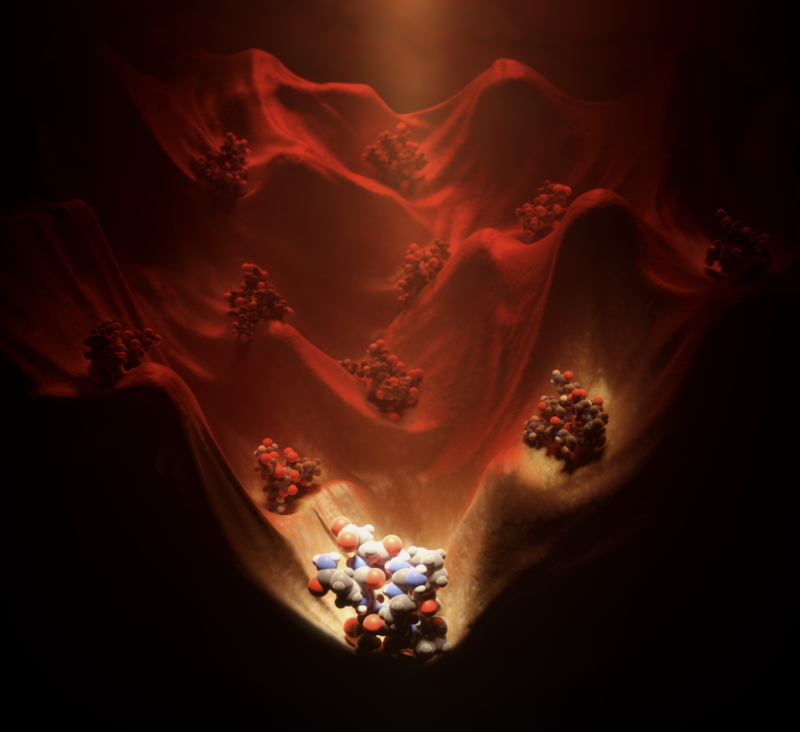 The new nanoparticle vaccine based on DS-Cav1 was ten times more potent than DS-Cav1 alone, suggesting it may translate into a more effective vaccine with more durable protection. “This is the first of many vaccine candidates we have made using this technology,” said senior author Neil King. 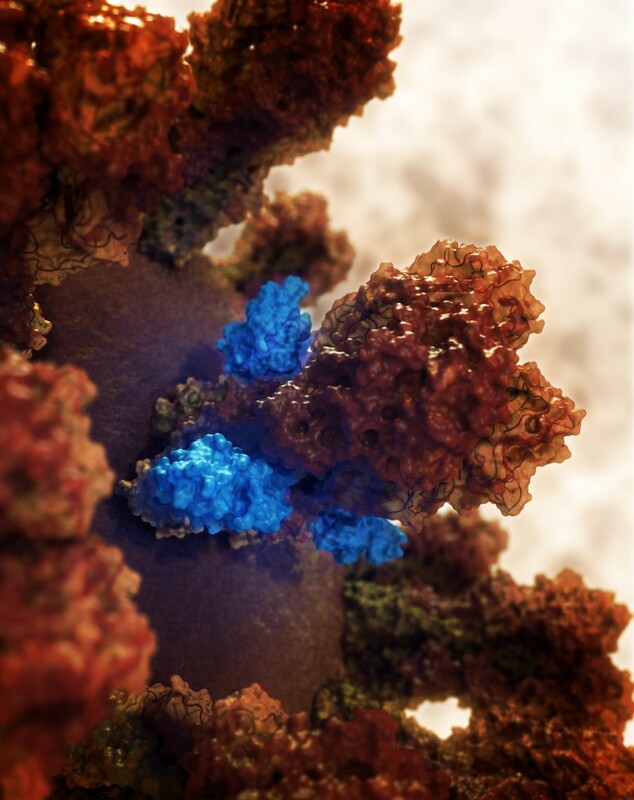 By swapping out the proteins along the outside of the nanoparticle, King and his team hope to create new vaccines candidates for HIV, malaria, and even cancer. The RSV vaccine team was led by researchers at UW and the Institute for Research in Biomedicine in Bellinzona, Switzerland. It also included scientists from the Fred Hutch Cancer Research Center in Seattle, USA; the Karolinska Institute in Stockholm, Sweden; the Vaccine Formulation Institute in Godalming, UK; the European Virus Bioinformatics Center in Jena, Germany; the Vaccine Formulation Laboratory at the University of Lausanne, Switzerland; and the ​Institute of Microbiology at ETH Zürich, Switzerland. The project was funded in part by the Bill and Melinda Gates Foundation. 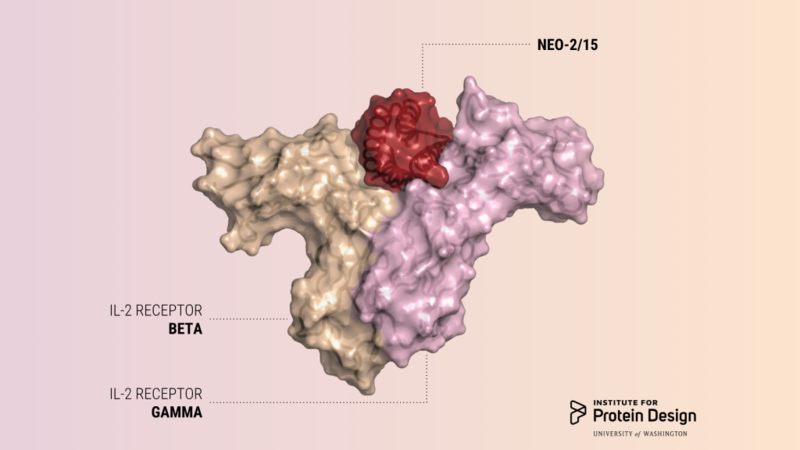 Today we report in Nature the first de novo designed proteins with anti-cancer activity. Daniel, Umut, Carl Walky and Alfredo Rubio from the IPD have started a company to help bring this exciting drug to market. We wish them the very best in their new venture! 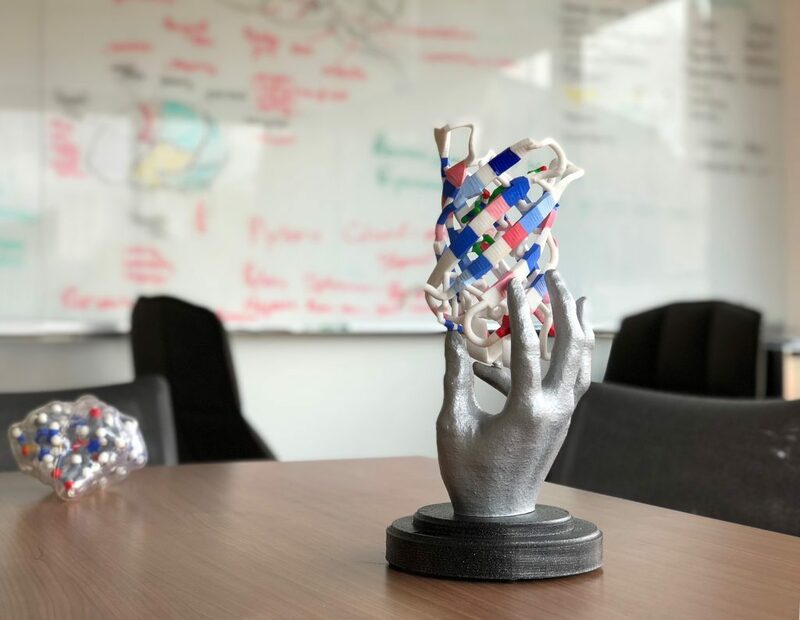 To close out the year, Baker Lab scientists published a new report describing the creation of proteins that mimic DNA. 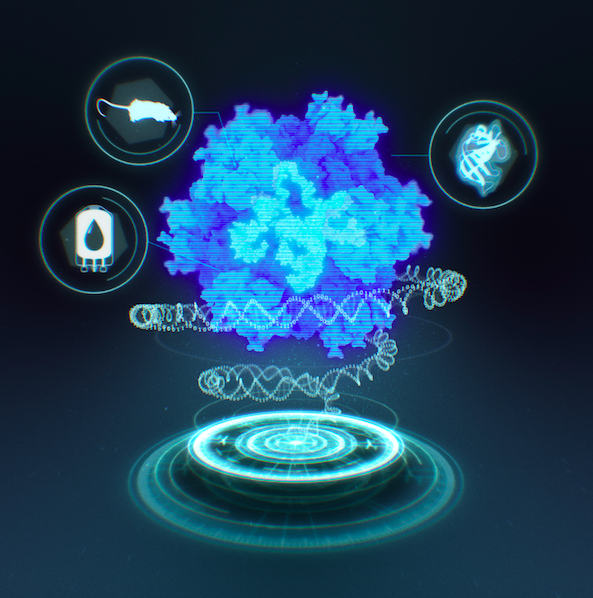 We believe this breakthrough will aid the creation of bioactive nanomachines. DNA is a widely used building material at the nanoscale because it is simple and predictable: A pairs with T and C pairs with G. Because of this, DNA strands can be programmed to click together into precise and increasingly complex structures. But DNA has drawbacks. It is not as bioactive as RNA, and not nearly as active as proteins. 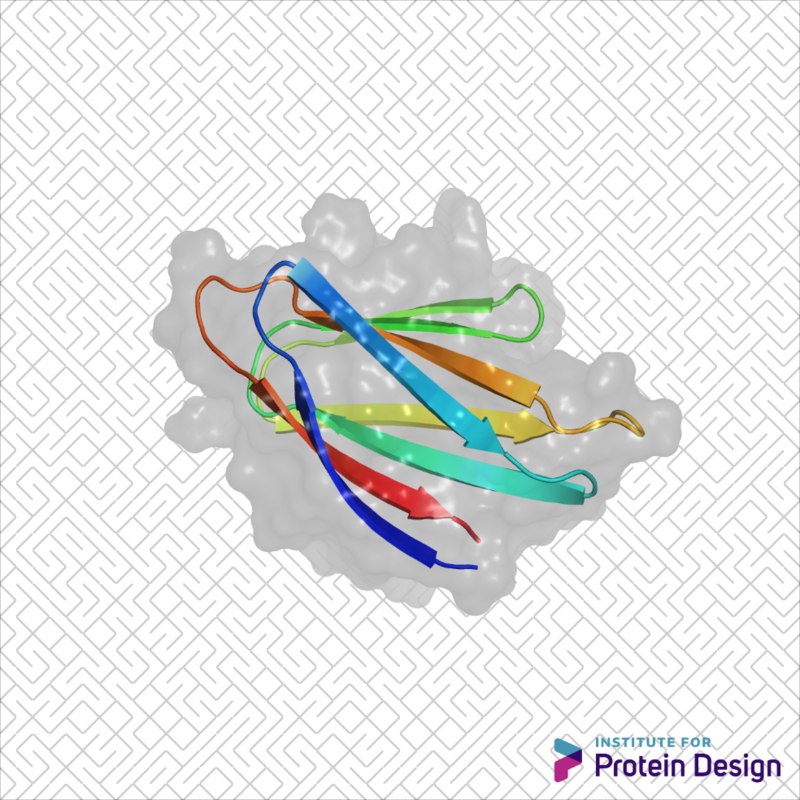 Bioactive protein assemblies run cells (kinetochores, polymerases, proteasomes, etc). 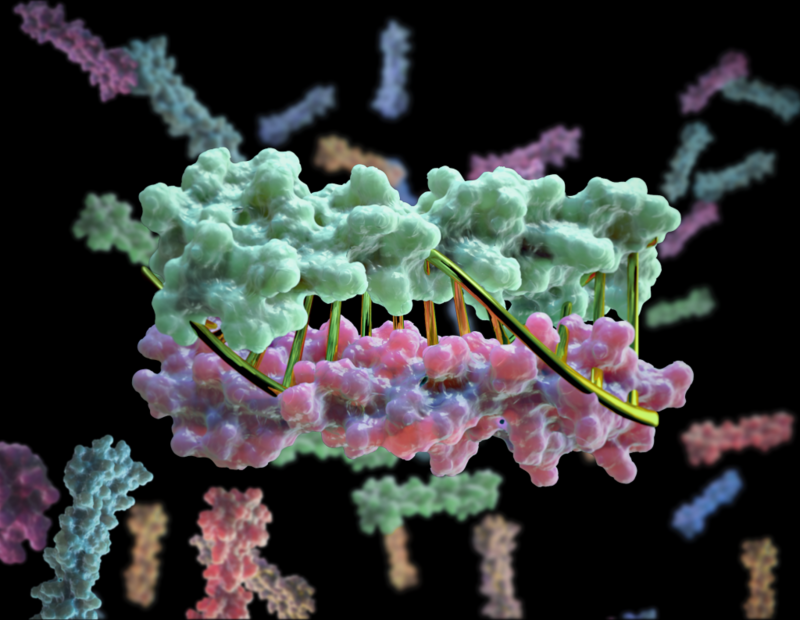 What if designing them was as easy as clicking together DNA? 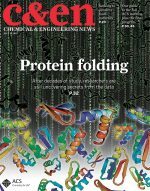 Using computational design, we created heterodimeric proteins that form double helices with hydrogen-bond mediated specificity. When a pool of these new protein zippers gets melted and then allowed to refold, only the proper pairings form. They are all-against-all orthogonal. 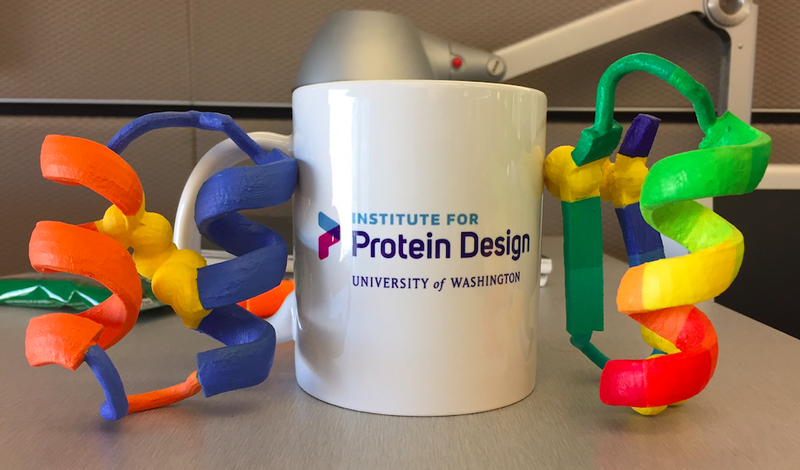 With these new tools in hand, we can now begin constructing large protein-based machines that self-assemble in predictable ways. 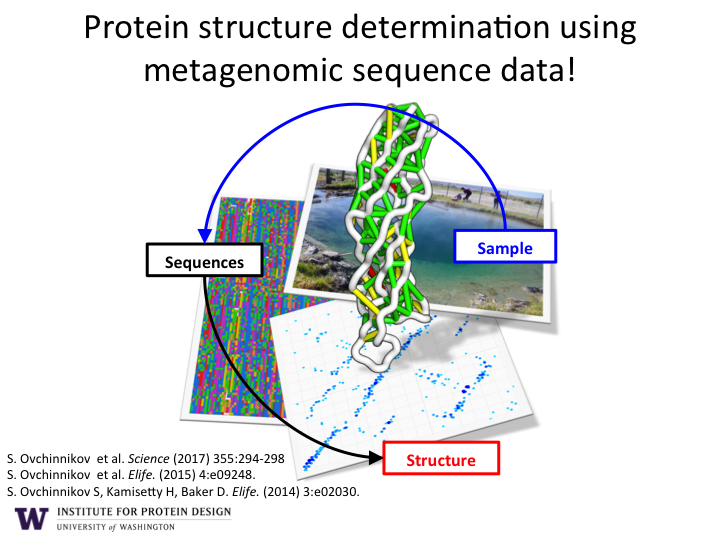 This project was led by graduate student Zibo Chen and was done in collaboration with the Wysocki Lab at Ohio State University and the Sgourakis Lab at the UC Santa Cruz. 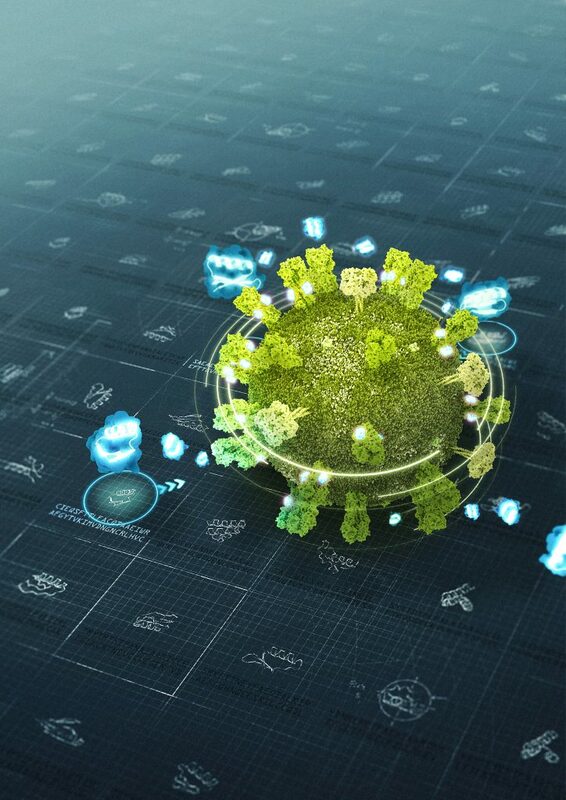 The work used support from the SIBYLS program with SAXS and the ALS resources at LBNL, as well as the Argonne Leadership Computing Facility at ANL. 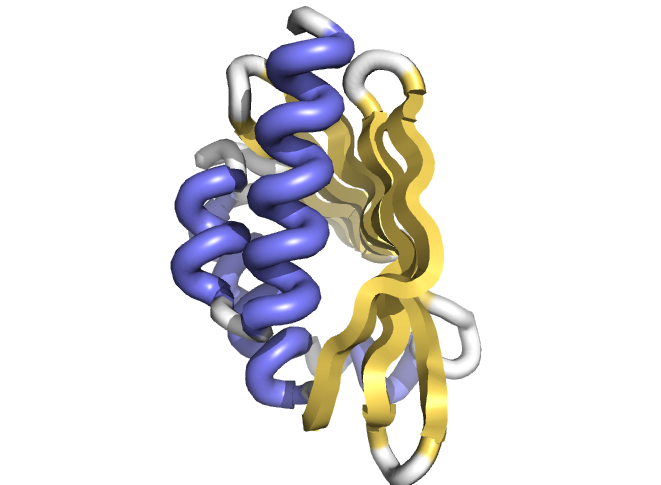 The basic parts of proteins — helices, strands and loops — can be combined in countless ways. But certain combinations are trickier than others. 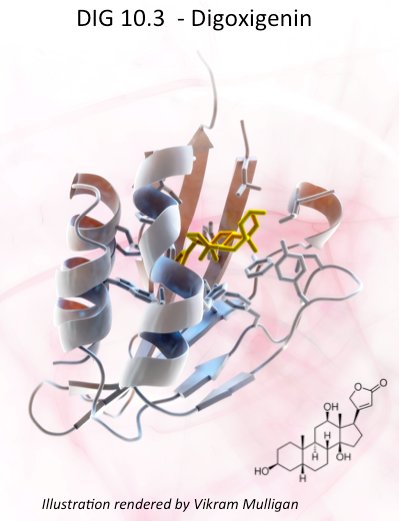 This week scientists from the IPD, along with collaborators in Brno and Santa Cruz, published the first-ever example of designed non-local beta-strand interactions. 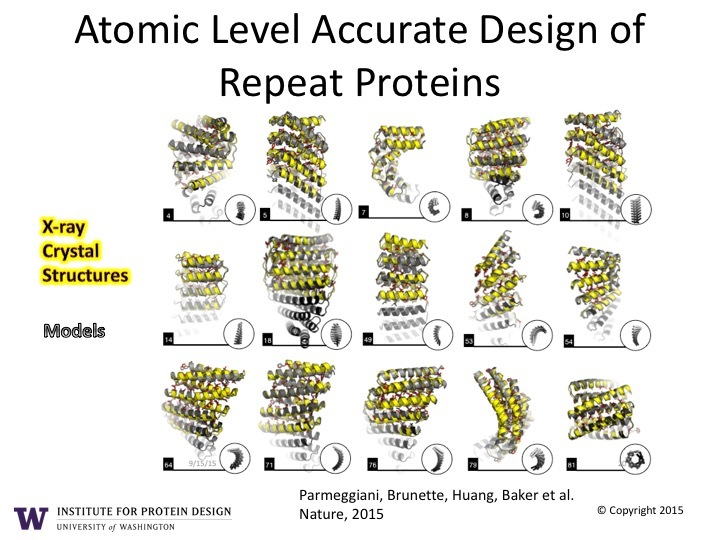 Beta-sheet proteins carry out critical functions in biology, and hence are attractive scaffolds for computational protein design, but the de novo design of all-beta-sheet proteins from first principles has lagged far behind the design of all-alpha or mixed-alpha-beta domains. 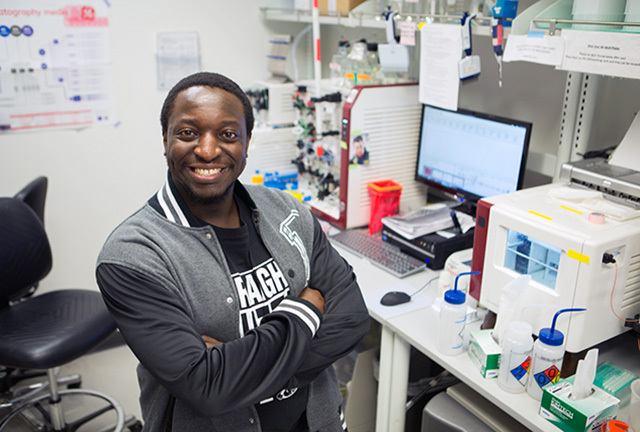 Tamuka M. Chidyausiku, a biochemistry graduate student, was one of the project leaders. Local beta-strand interactions occur when residues near one other hydrogen bond to form compact sheets. To get similar interactions from stretches of residues that are not close in primary sequence, a protein backbone must fold into a complex interwoven shape. The successful design of non-local beta-strand interactions demonstrates a significant advance in our ability to control both fine features (such as precise hydrogen bonding) and global features (such as complex topology) in proteins and opens the door to the design of a broad range of non-local beta-sheet structures. By studying loops that connect unpaired beta-strands (beta-arches), the team identified a series of structural relationships between loop geometry, side chain directionality and beta-strand length that arise from hydrogen bonding and packing constraints on regular beta-sheet structures. 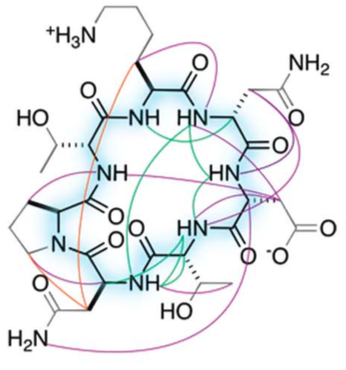 They used these rules to de novo design jellyroll structures with double-stranded beta-helices formed by eight antiparallel β-strands. NMR of a hyperthermostable design closely matched the computational model, demonstrating accurate control over the beta-sheet structure and loop geometry. In the summer of 1961, Osamu Shimomura drove across the country in a cramped station wagon to scoop jellyfish from the docks of Friday Harbor. He wanted to discover what made them glow. It took Shimomura and other biochemists more 30 years to find a full answer. By then, recombinant DNA technology allowed researchers to clone and characterize the two proteins responsible: aequorin and GFP. The latter would earn Shimomura his share of the 2008 Nobel Prize. GFP, a 238-residue beta-barrel with a covalently linked chromophore, transformed how scientists study cells and the molecules in them. As a genetic tag, GFP has illuminated the inner workings of human brain cells, bacteria, fungi and more. 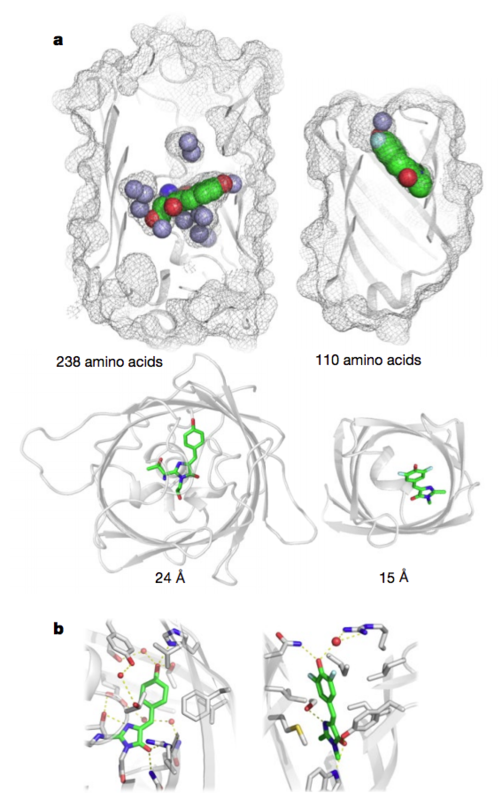 This week, scientists from the IPD report in Nature the design of a completely artificial fluorescent beta-barrel protein. 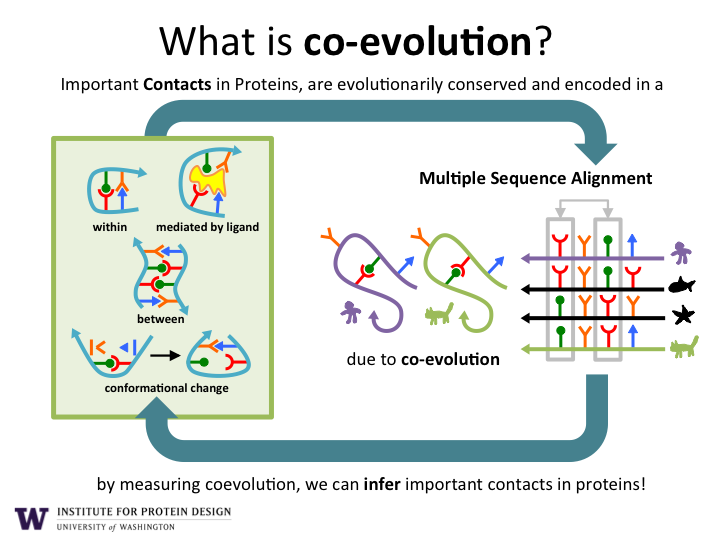 Many natural proteins evolved to bind small molecules. 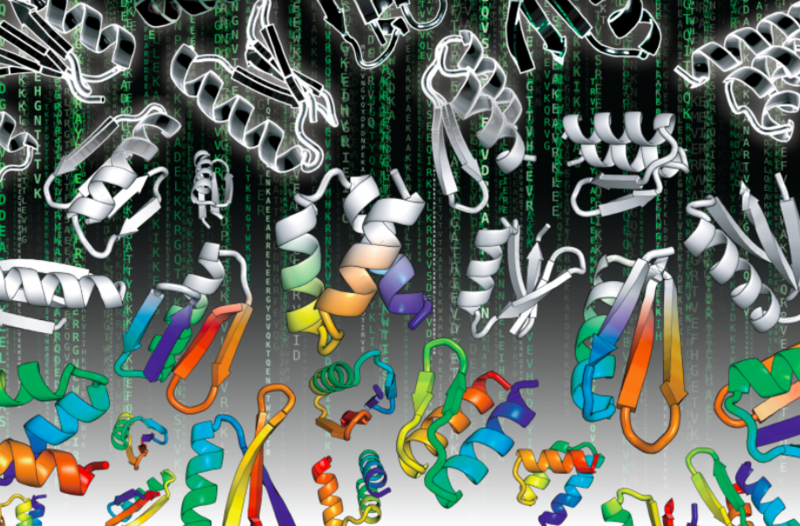 Reengineering such proteins is rarely straightforward, limiting how they can be applied. The new findings demonstrate that proteins unlike any found in nature can be rationally-designed to bind to and act on specific small molecules with high precision and affinity. 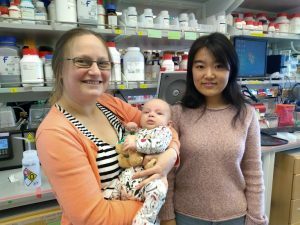 The lead authors of the paper are Jiayi Dou, Ph.D and Anastassia A. Vorobieva, Ph.D., then both senior fellows in the Baker lab. Anastassia Vorobieva with her son Alexandre (left) and Jiayi Dou (right). To make the fluorescent protein the researchers had to achieve another first: Creating beta-barrels from scratch. 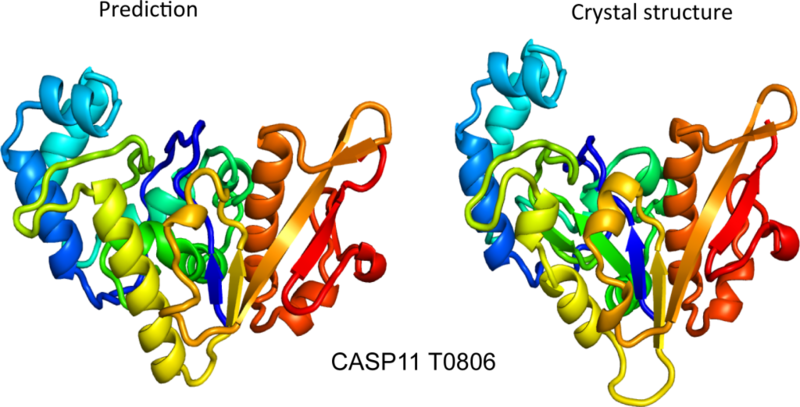 The fold was ideal because one end of its cylindrical shape could be used to stabilize the protein while the other could be used to create a cavity that would serve as the binding site for the target molecule, DFHBI. 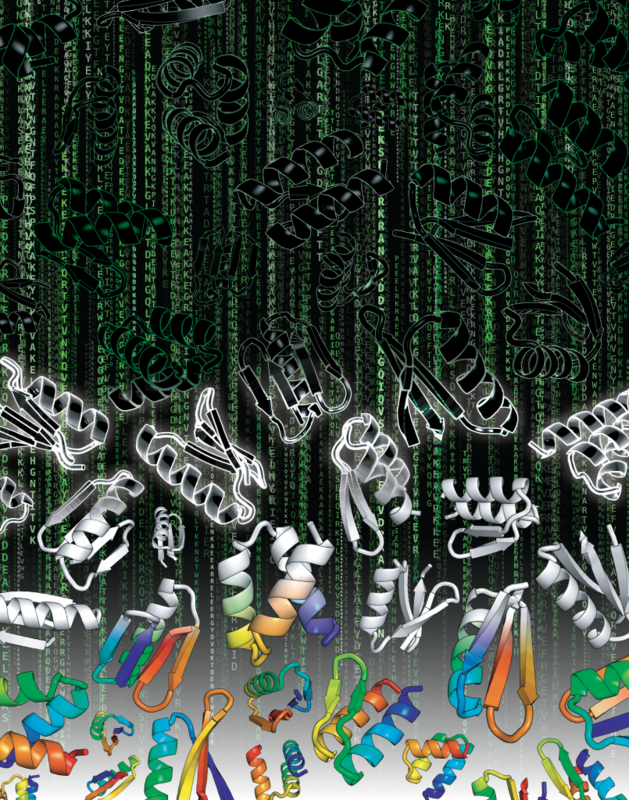 In nature, beta-barrels proteins bind a wide range of small molecules. Rosetta was used to design the scaffold de novo. 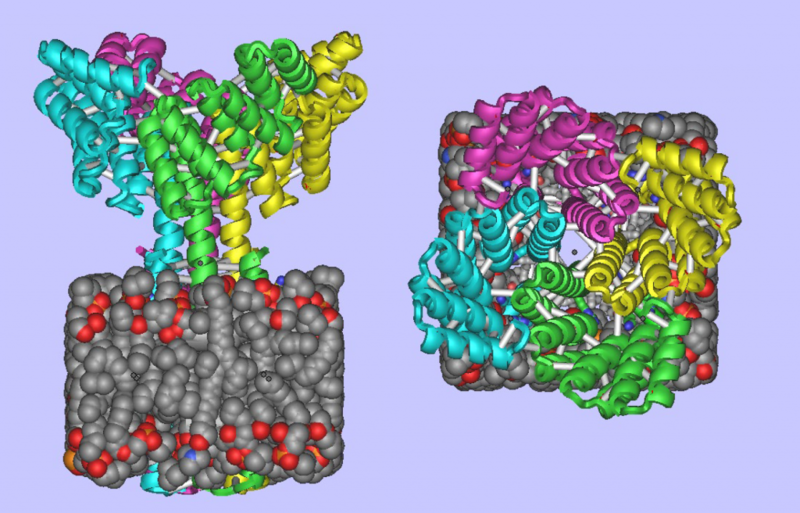 To create the cavity, the team used a new docking algorithm called the “Rotamer Interaction Field” or RIF, developed by William Sheffler, Ph.D., a senior research scientist in the Baker lab, that rapidly identifies all potential structures of cavities that fulfill the prerequisites for binding specific molecules. 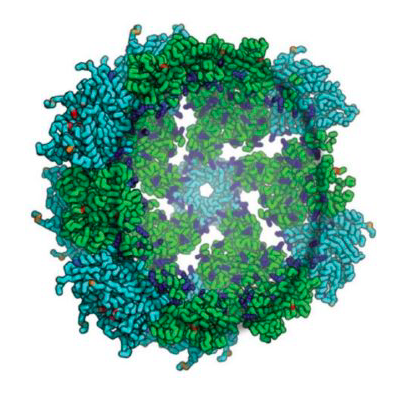 The designed protein absorbs blue and emits cyan light. It is stable up to 75°C.